Lou Loves Beauty: Christmas Shopping Tips for Men. 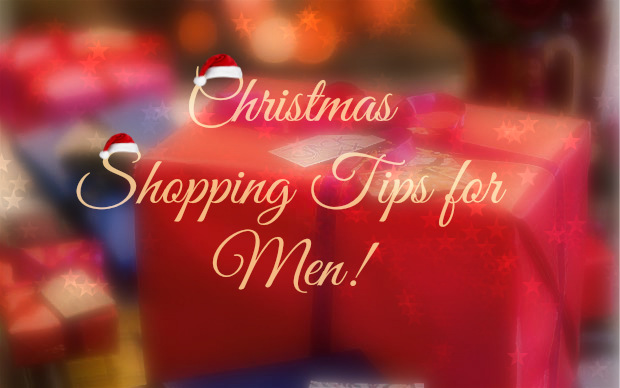 Christmas Shopping Tips for Men. It's that time of year again when most men break out into cold sweats, the thought of what to buy their wives, girlfriends, mothers and sisters becomes too much to bare and they end up getting them something inappropriate or damn right useless! Well worry no more, I'm going to outline some very simple tips on buying presents for the ladies in your life. First of all, please do not and I repeat do not go shopping on Christmas Eve unless you have a list of exactly what to buy! There is nothing like seeing a man wondering around department stores at 5pm on Christmas Eve with the look of dread and utter bewilderness in his eyes. No wonderful present was ever bought this way and in no way enter a garage and think, "Yeah she'd love a CD that's 10 years old or a magic tree air freshener!!" All this will do is ruin both your Christmas's!........ You have been warned! Every women likes perfume, its not something many of us buy ourselves throughout the year so this is a good place to start. Finding a scent she will like can be tricky, we all have different tastes, so a good way of finding out what she likes is to have a peek though her perfume cupboard (or ask someone to do it for you). See what perfumes she has and make a note of at least 4 of them, all to be a least half empty so we know she likes them. Take this list to your local department or perfume store, find a lovely assistant and ask them for help. If you find this alone a daunting task worry not, I'm sure she will be more than happy to help you out rather than see you looking like a lost child in a supermarket, overwhelmed by all the different brands and scents on sale. She can advice you on perfume's within the same category as the ones you have given her. All you need to do then is pick the one you like the smell of the most. Picking a perfume you like the smell of will show that you have given some thought to the present. You can tell her why you liked it and I'm sure this alone will impress her as you have choosen it yourself. I love a good pamper session and no one is complete without candles and luxurious bath products. There are loads on the market and making a your own gift hamper can be really simple. All you need is a basket or pretty box, some shredded paper and a few of her favourite bath and shower products. Boots do some great products from Soap and Glory and the Sancturary range, which include bath, body and candles to add to your basket, all reasonably priced. Jo Malone, Neom and Miller Harris are a few of the higher end brands (you could always mix and match). As a finishing touch add a bottle of champagne or her favourite wine to make it even more special. Now this is a no go area unless you are 100% sure of her size. No one what's a gift that is A. too big or B. worst, too small! Opt for clothing like pyjama and sleep wear which normally come in in between sizes like 10/12 12/14 14/16 etc, so not to offend anyone or upset them on Christmas day. Scarves, hats and gloves are universal so this would be another option. If you know her style well treat her to a new pair or shoes or boots, ask friends and family if she has her eye on anything. Treating someone to a pamper day at a hotel or spa is a great gift if you're not sure what to get them. Most ladies loved to be pampered, make sure to get two tickets though so she could take someone along with her. Theatre tickets are also a good idea if she likes going to shows. Find out her favourite, or one she will be the most interested in and make a day of it with dinner or even an overnight stay. Weekend away for you and your partner without the kids (if you have any). Get a family member to babysit. This is also a great gift for your mother and father, sister and boyfriend and combines two gifts into one! A few tips on what NOT to buy her, unless she has specifically asked for them! anything that involves the day to day running of the house i.e. Hover, Iron or frying pan! Anything Electrical,.......no she doesn't want that Black and Decker power tool!! If you're still really stuck on what to get, ask a friend or family member to do some detective work on your behalf, there must be something that she wants this year!? What a great post! Think I would like footie tickets too though. Haha it makes me giggle that 'anything for the kitchen' appeared on the 'what not to buy for her list'. My dad has bought far too many kitchen things for my mum over the years, poor her!